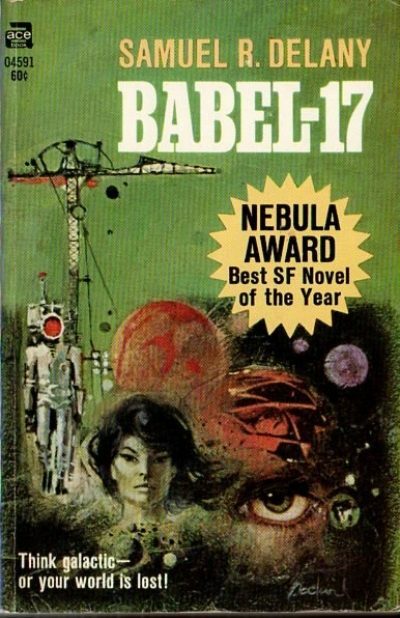 1966’s Babel-17 is an SF novel by Samuel R. Delany. Not his first (he had already published a number of Ace Doubles and one standalone), but the one that made his name. It shared the Nebula with Flowers for Algernon and was nominated for the Hugo as well, losing to The Moon is a Harsh Mistress. It shares some elements of its setting with an earlier Delany novel, Empire Star. There’s a correlation between Babel 17 broadcasts and acts of sabotage. Perhaps the invaders are signalling instructions to their agents in the field? But that’s not quite what’s going on. The invaders have weaponized language; anyone who learns Babel-17 will find their thoughts controlled by the worldview baked into the language. If Rydra learns Babel-17, she may become a tool of the invaders too. Early 20th century anthropologists were broadly receptive to ideas now known as grouped together as the Sapir-Whorf hypothesis . Language gives people the tools to name and understand the world; to the extent that different languages cut up the world in different ways, people are primed to see the world in those ways. Some anthropologists and linguists saw language as determining thought; others saw it as influencing thought. The notion is much less popular these days, as there proved to be little experimental evidence for determinism, though some for influence. The hypothesis was popular in its time and has inspired not just one, but at least two SF novels. Suzette Haden Elgin’s Native Tongue imagines a language that, once learned, undermines the patriarchy. You may not believe in the Sapir-Whorf hypothesis, but it has inspired two quite readable novels. If we’re going to accept FTL travel, wormholes, ansibles, telepathy, etc. for the sake of the story, we might as well accept this hypothesis for the duration of the novel. Babel 17’s galaxy is heterogeneous. Unlike so many of US SF’s galactic settings, settings blandly uniform and inhabited by thinly-disguised Southern Californians with no political differences at all, the Alliance encompasses several species. Even its human populations belong to a range of cultures and accept a variety of behaviours. Customs differ between occupations: what’s normal for government functionaries is not the norm for spacers. Members of the Alliance may not always enjoy the diversity; there’s a lot of grudging toleration garnished with thinly disguised judgments. That may not seem like such a great accomplishment but … turn on the real-world news if you want to see what rampant xenophobia looks like. Perhaps it takes an outsider like Delany to imagine diversity … and imagine how it might work in a galactic setting. I liked the setting. I was less thrilled with the plot, which seemed both thrilleresque and slight. As well, the characters seemed a bit thin. However, this is quite a short novel and I may have been spoiled by more than fifty years of an increasingly diverse SFF field; what seems humdrum now was something worth celebrating back then. Does the book still resonate for you? Tell me about it in comments. Babel 17 is available here (Amazon) and here (Chapters-Indigo). Sapir-Whorf is also at the back of Jack Vance's The Languages of Pao - which is certainly readable; I'd be hard put to find a Vance novel that doesn't reach at least that level. Babel-17 I remember more for the inventive details of the setting than for its actual plot - and, come to think of it, there are gaps in the world building, now I recall it: it's never quite clear who the Invaders are and why they're Invading, and the background of the war throws up some odd inconsistencies (they have all this luxury living, recreational cosmetic surgery and the like, and yet every so often they get blasted down to the point where they're scavenging for rats in the streets.) Still. It's certainly a book that's stayed with me, over the years... and one has to respect the cleverness of the concept, even if the strong Sapir-Whorf hypothesis is hopelessly exploded these days. There was a moment where I wondered if there really were Invaders or if that was just a convenient lie the powers that be used to justify the ongoing war effort. And then you get a renaissance, a virtual explosion of conceptualization and social change, when you have new ways to talk, and thus think, about certain things that felt baked-in to all of humanity, like...oh, let's say gender - but not everybody's ready or willing or able to cope with this linguistic-based upgrade, see all the people worked up over the very idea of new or revised pronouns, even after more than a decade of common adoption online. Some humans are inventive and communicative and some are less so. I wonder if Sapir-Whorf was unfairly damaged by research on university students, who might be a lot more open and flexible minded than the general population. Meanwhile evil corporations and politicians are using the theory to make us accept "goodness" as an ingredient in breakfast cereal and not in the policy platform of their opponents. A feature of Star Trek (Next Gen) novel "Debtors' Planet" is xenophobia of native population of the planet Megara, with the words for "extraterrestrial" and "devil" being nearly the same - and they've met the Ferengi - but it's made a minor point of victory of mind over linguistic programming that some of the Megarans spontaneously decide that they're dealing with "good devils" from the Starship Enterprise. Sapir-Whorf is also the basis of Ted Chiang's Story of Your Life/Arrival. It's an interesting reversal that the Invaders, the bad guys, are all Americans, while the viewpoint characters in the Alliance are not. Early printings of Babel-17 miss some of the nuances of the language that are brought out in the typesetting of later releases; which allow you to see that some scenes are doubled from the viewpoint expressed in Babel-17 vs the language of the Alliance. The result is quite fascinating - and obviously builds on the typographical techniques used by Bester. It doesn't look as if anyone has mentioned it yet, so I'll point out Stranger in a Strange Land as another Sapir-Whorf novel: All of Valentine Michael Smith's esoteric abilities come about because he grew up speaking Martian, and his human disciples gain similar abilities and share his enlightenment as they become fluent in Martian. Heinlein doesn't explicitly name Whorf, but the ideas put forth by the semanticist Dr. Mahmoud seem to include a fair dose of linguistic relativity. I remember being disappointed by the slightness of the story. I though the idea sounded great, but the execution disappointed. And now I can barely recall the story or plot but I’m not inspired to reread. I mostly remember the structure, which is rigidly balanced around a central chapter in which virtually all the changes happened, with direct parallelisms between the first half and the second half, showing the differences. The final chapter is not paralleled and ends by opening to the new situation. Just reread this recently and it does still stand up. Perhaps being older myself now, I felt like I understood the general better on this reread, as well as some of the other (also older) characters. It is not, as has been said, a large novel, but is certainly a good one. The structure Tamar remarks on reminds me of something Delaney noted in "The Jewel-Hinged Jaw": the idea of presenting the same concept in two different contexts to better illuminate it.